Mamiya's monster ZD is a reality. 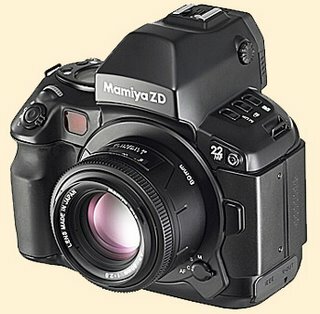 It features a huge 48mm x 36mm Dalsa CCD sensor, 22 megapixels, 35MB RAW files of 5328 x 4000 pixels, and ISO speeds of 50–400. It weighs only 1300 grams, has a 98% viewfinder, and requires only about a 1.15X conversion factor (from 645). It accepts all existing Mamiya 645 lenses. Now that's what I call full-frame. They only support up to ISO 400! Must be significant high ISO noise problems with the sensor. Monster Mash? Looks like the new version of the Pentax 6x7 has arrived. But can the average photographer -- pro or otherwise -- afford it? I know what Phase One and Leaf backs cost. More than all my anlalog and digital equipment put together!!! And I own no small amount of gear. And add the cost of the computer horsepower needed to process really, really, really, (did I say really?) big files, and unless you are a super successful photo duded, you can't afford it. True, Pitchertaker, but then again I don't think the average photographer needs it. It's the sort of thing that will be best suited for studio pros and landscape fine-art photographers. Frankly, 8 megapixels is a generous yet still practical size for anyone up to the top amateur level. The standard for editorial photographers has always been the "double-truck," or a two-page magazine spread. I'm not sure how editorial photogs are finding the correspondence between repro size and number of pixels; it would be interesting to find out.